I was in Baltimore for a weekend after a week teaching a cybersecurity course in Annapolis, Maryland. 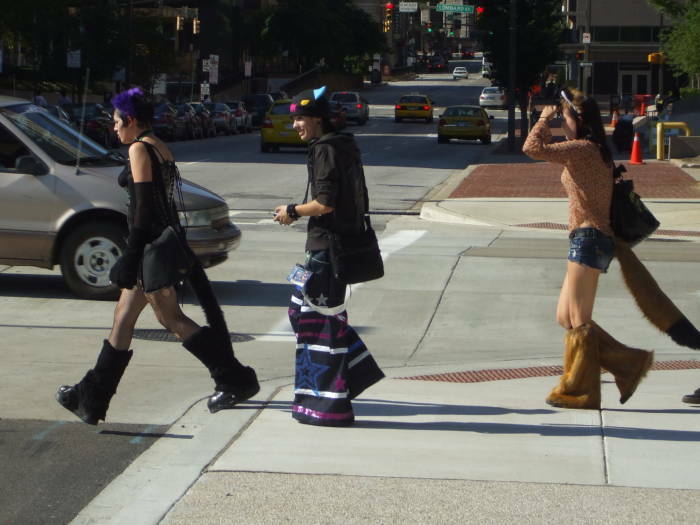 There was a certain pattern to some of the people walking around the city. A zoömorphic quality to the people. 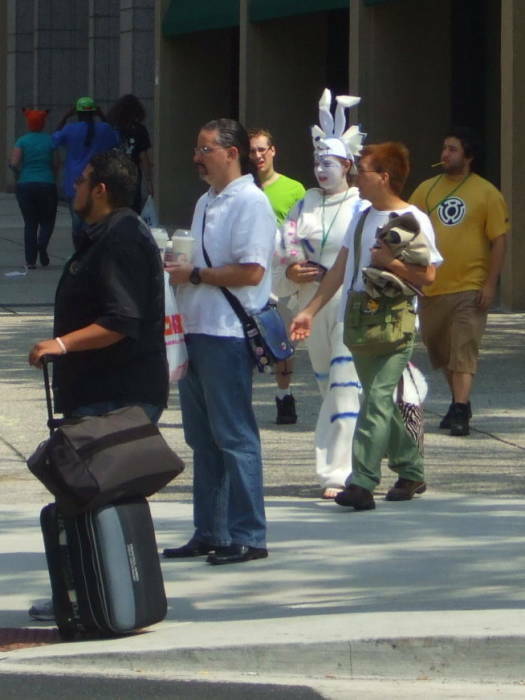 Or, I should perhaps say, a certain anthropomorphic quality to the fox people I saw. 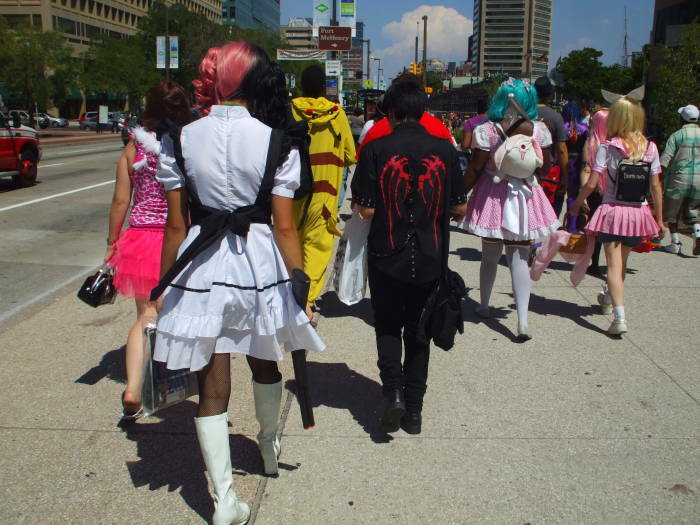 It was the weekend of Otakon, the major U.S. convention of extreme fans of all things anime and manga. 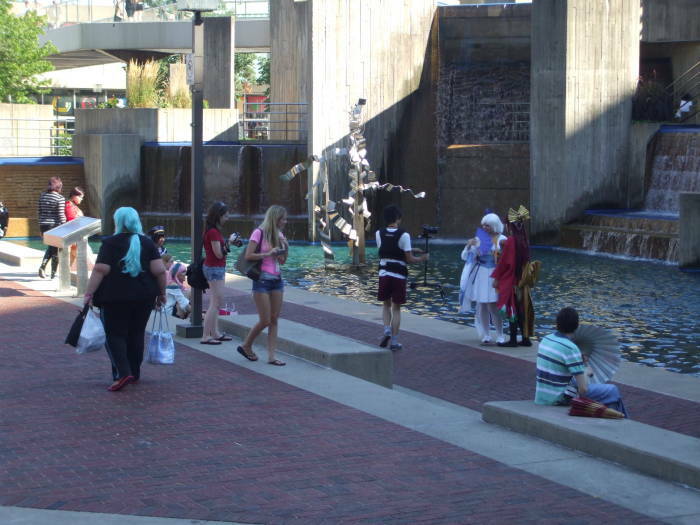 Otakon takes its name from a combination of otaku and -con, as in convention. It is a convention of the otaku. 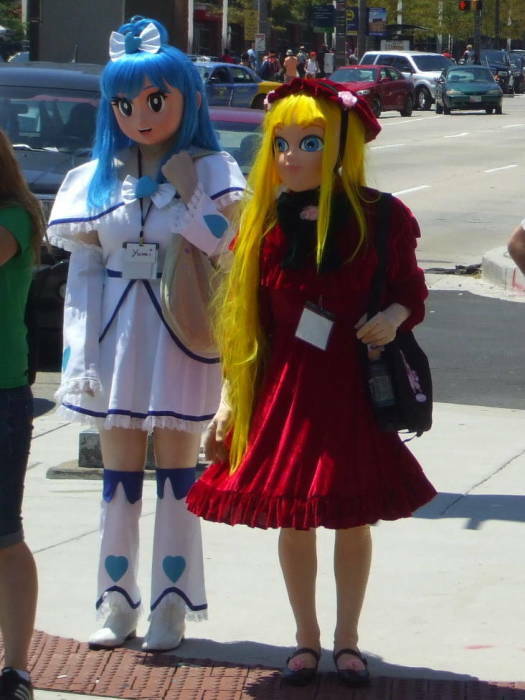 Otaku is a modern Japanese slang term referring to people with obsessive interests, especially in manga (Japanese comics or graphic novels), anime (Japanese animation based on manga), and video games. It was as if I had wandered into some corner of 4chan, although fortunately neither /b/ nor /k/. 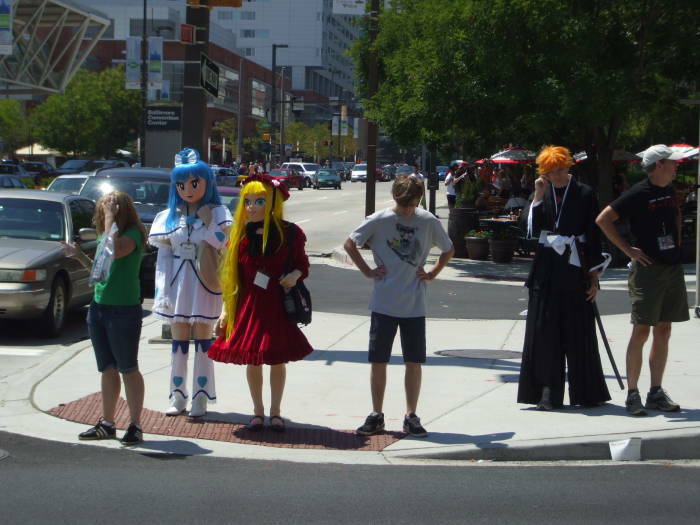 Most members of Japanese society consider otaku to be an unfavorable term, although some obsessive fans in Japan use the term to describe themselves and their friends. For example, Taro Aso, the Prime Minister of Japan from September, 2008 through September, 2009, has described himself as an otaku. 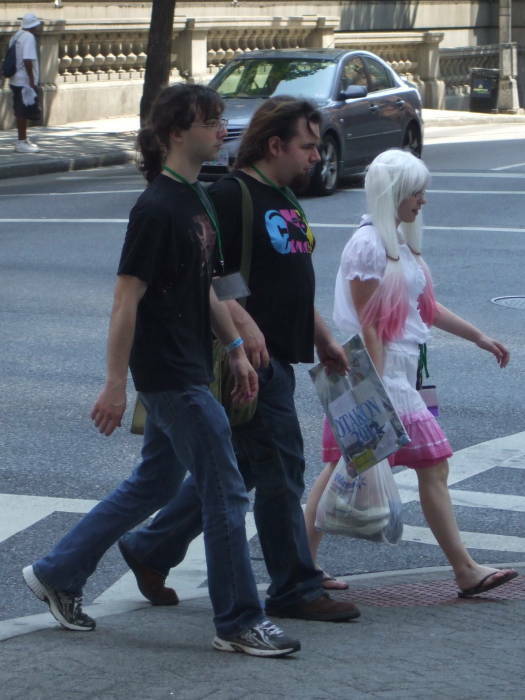 While otaku is used for self-description by American fans of anime and manga, Americans without an interest in all things Japanese might instead say fanboys and fangirls. William Gibson, who seems to have coined the word cyberspace in his 1984 novel Neuromancer, popularized the term otaku in his 1996 novel Idoru. Gibson later described his neologism "cyberspace" as an "evocative and essentially meaningless" buzzword serving as a reference point for his "cybernetic musings". The term "cybernetics" had been derived by industrial control theorists from the Greek κυβερνήτης and previously used mostly to refer to mathematical control methods applied for robot manipulator arms and cranes. This was no more main-stream than Russian language technical journal articles about matrix arithmetic using that terminology: Кибернетики and so forth. But now the U.S. Department of Defense has enthusiastically adopted the prefix cyber- as in cybersecurity, defensive and offensive operations in cyberspace, and even vague pronouncements about all things cyber. 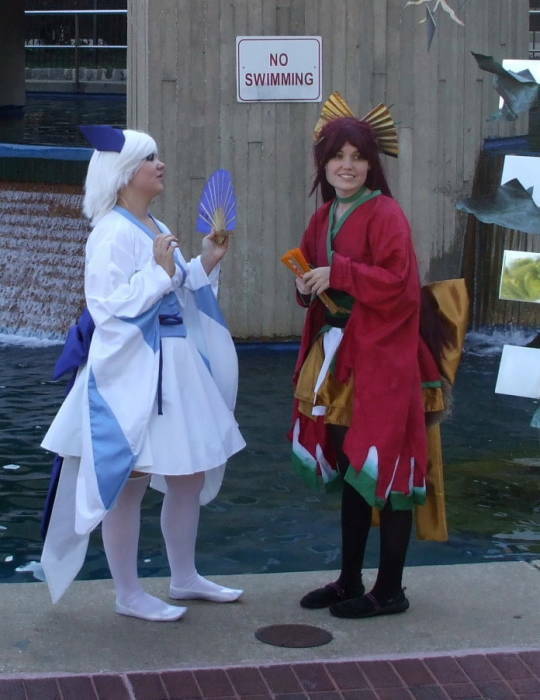 Some otaku are into cosplay, short for costume-play, the making and wearing of elaborate costumes and appearing in the persona of favorite manga and anime characters. Brilliantly colored wigs reflect the typical character design of manga and anime. 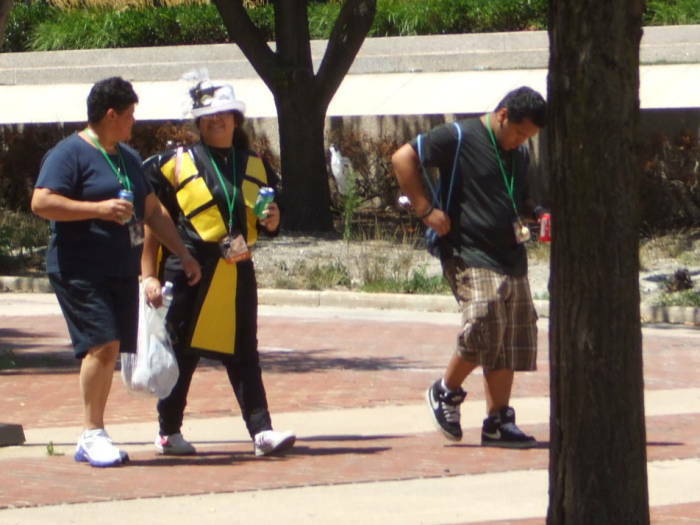 Lanyards with badges indicate Otakon attendees. 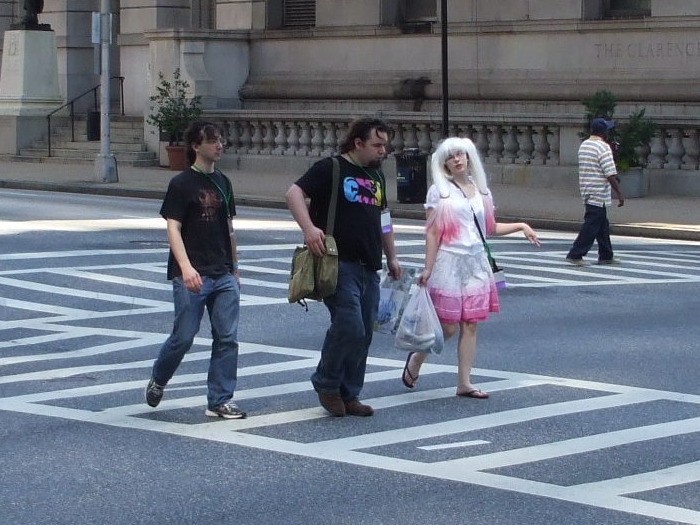 Pink dresses and platinum hair indicate the cosplaying Otakon attendees. 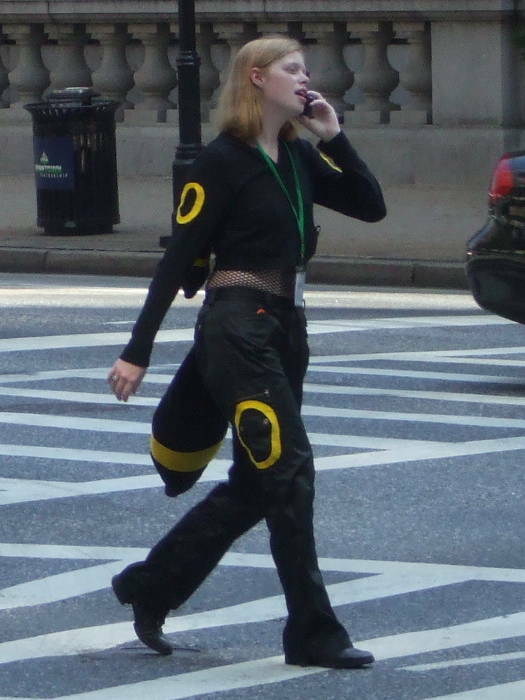 A weary fox girl cosplayer trudges up the street with her rolling suitcase, contacting other Otakonners on her mobile phone. Baltimore can be a tough town. 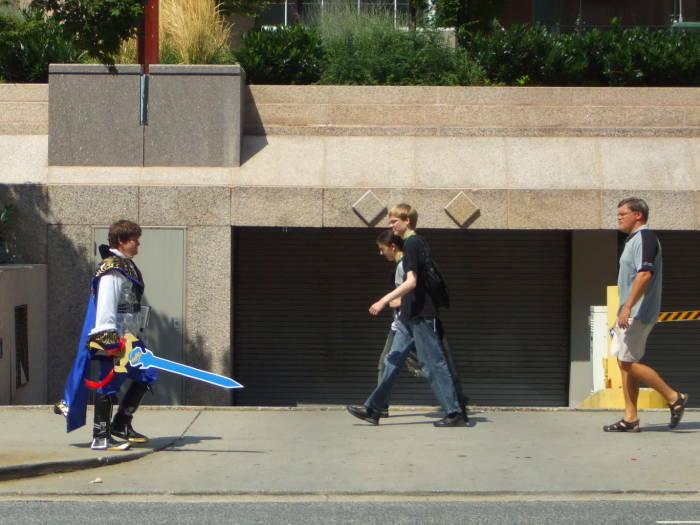 Be safe, carry a sword. And wear a cape while you're at it. 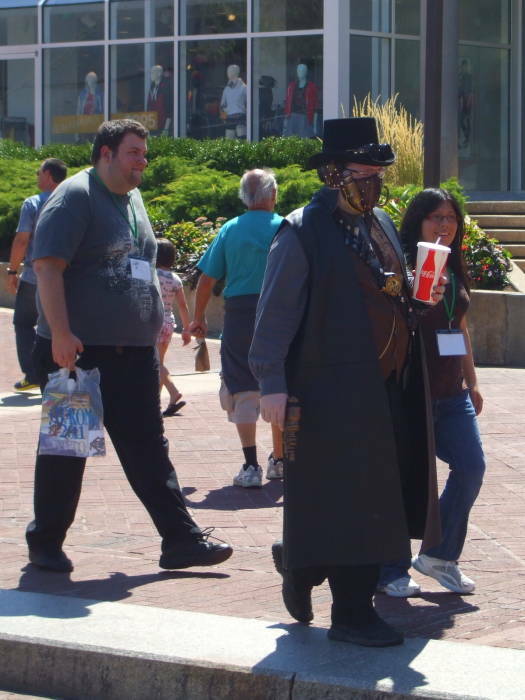 Voodoo cosplay, I think. I'm as mystified, and intrigued, as the guy talking on his phone. 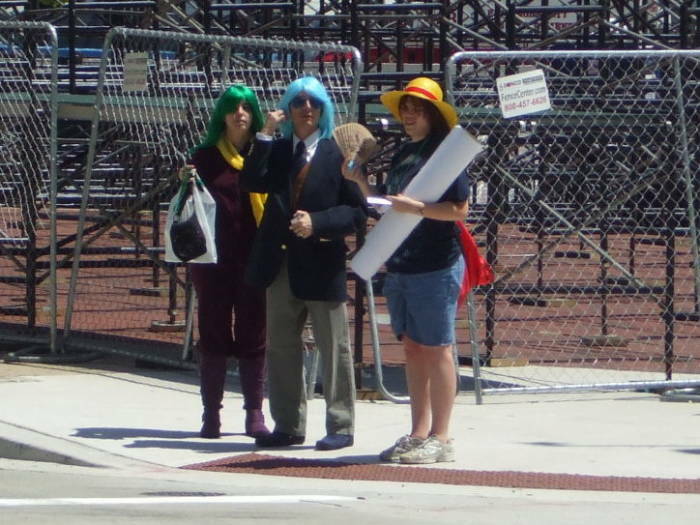 These multicolored wigs and blazers may be the American representation of the Japanese representation of the Young Republicans. 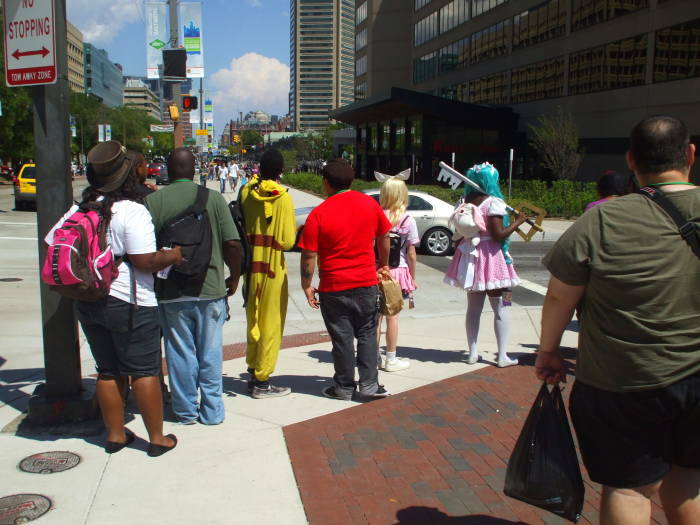 I was delighted to see the nerds of color at Otakon. It's a racially diverse event. 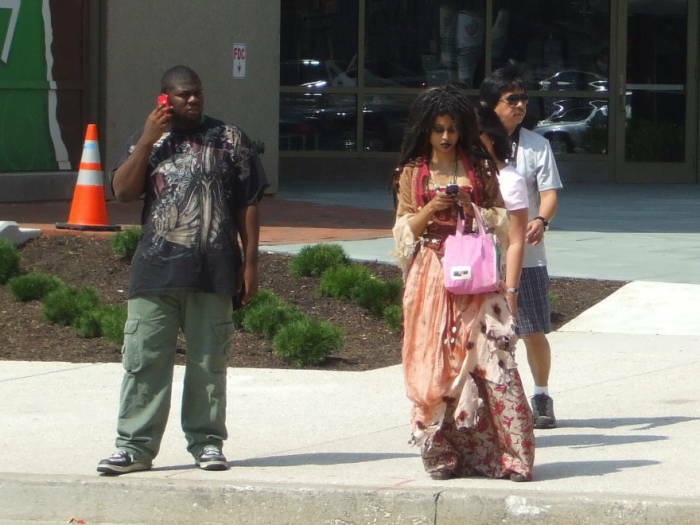 Among many other cosplayers, there was a hot Princess Jasmine and a well turned out Lieutenant Uhuru. 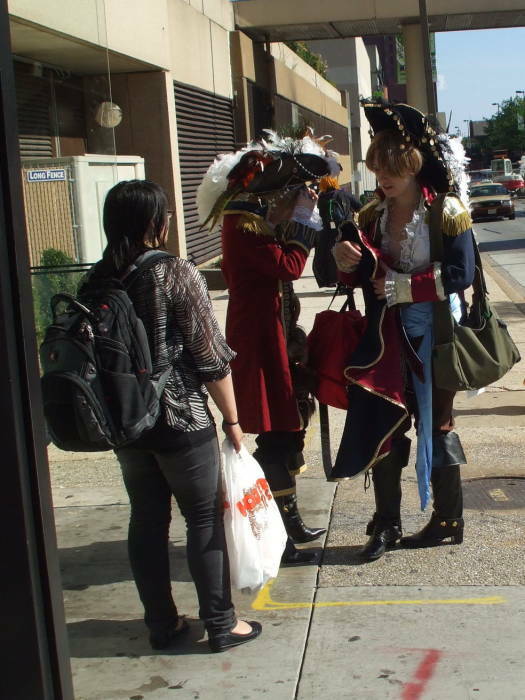 I was staying at the Baltimore HI hostel, which was largely occupied by Otakon attendees over the weekend. 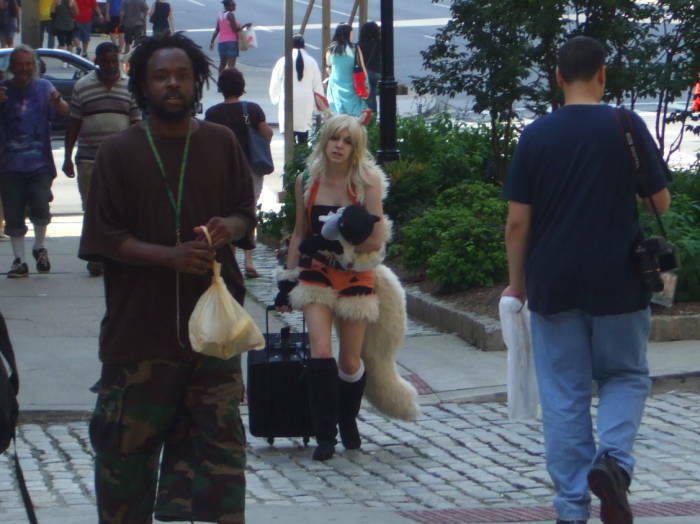 One guy sharing my room was a Black dude dressed as a Japanese dude who cosplays as a White dude. I complemented the complexity of his irony and said that it was "very, ah, Robert Downey, Jr." He said, "Yeah, I thought Tropic Thunder was hilarious." 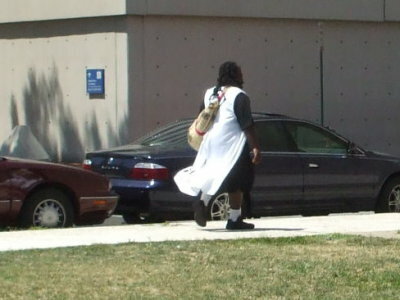 A dignified samurai strides away. 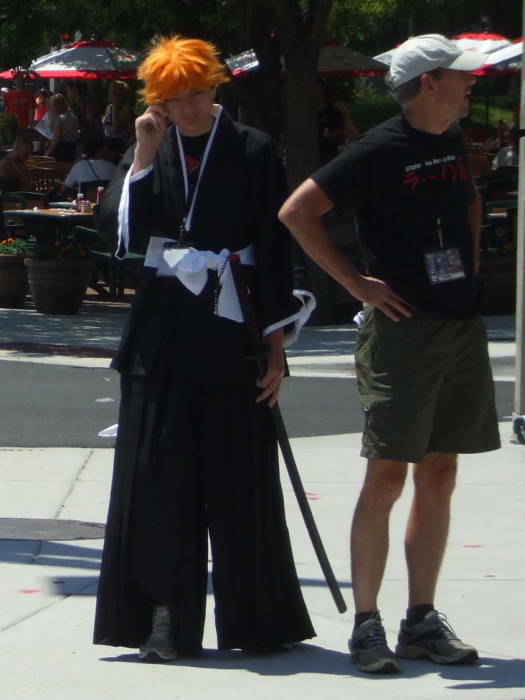 Here we see what seems to be the guy from Bleach and two cosplayers in full regalia as typical manga or anime girls. 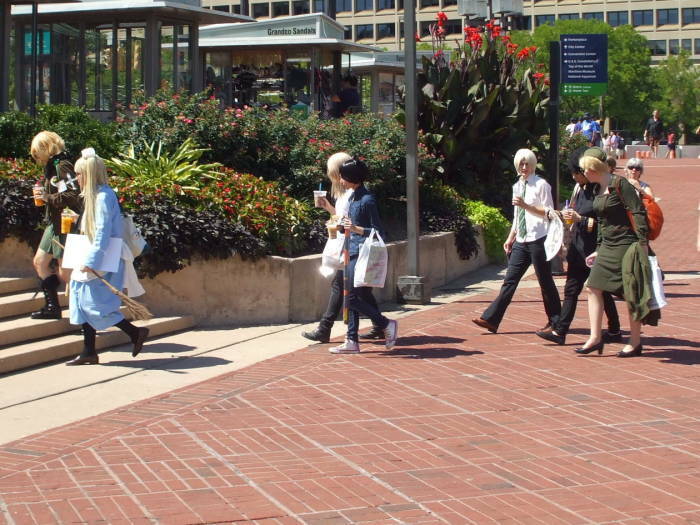 Pokemon and a collection of anime girls leave the convention center. 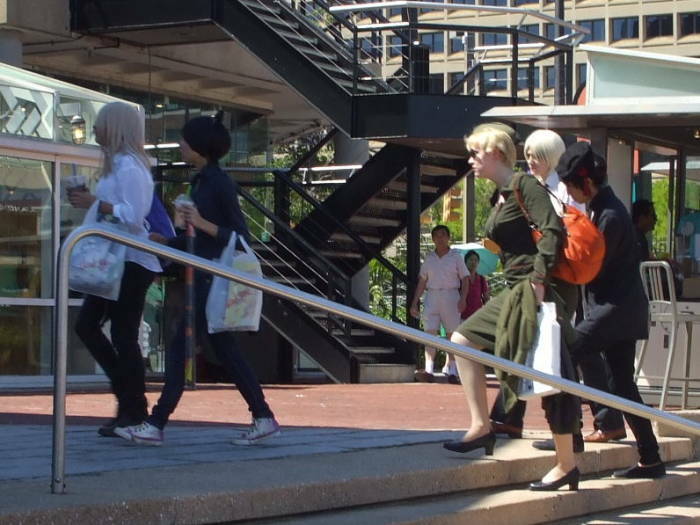 An otaku group arriving at the Inner Harbor includes what appears to be a Japanese member dressed as an American service woman from World War II. 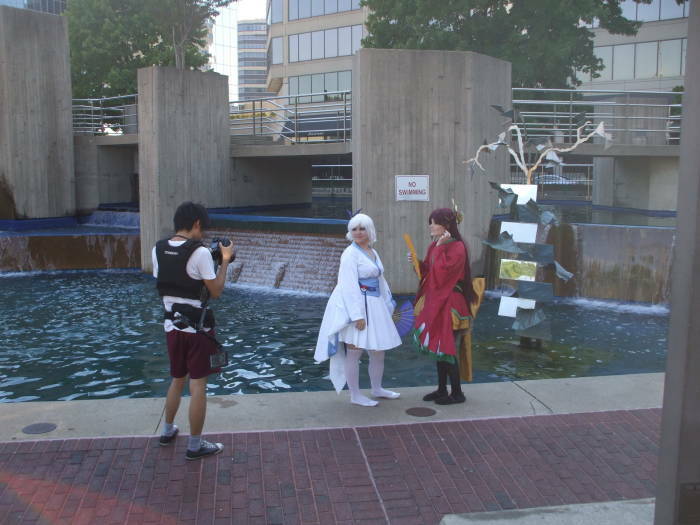 Some anime cosplay girls are being photographed at the fountain near the Inner Harbor waterline. If my Fuji camera weren't so slow to intialize and focus, then you could have joined me in seeing these two pirate girls making out. 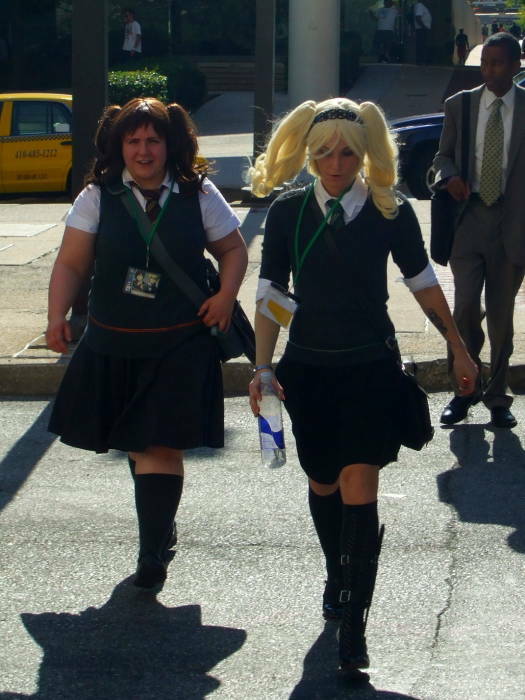 Two girls apparently from Sucker Punch leave the conference center area at the end of the day. 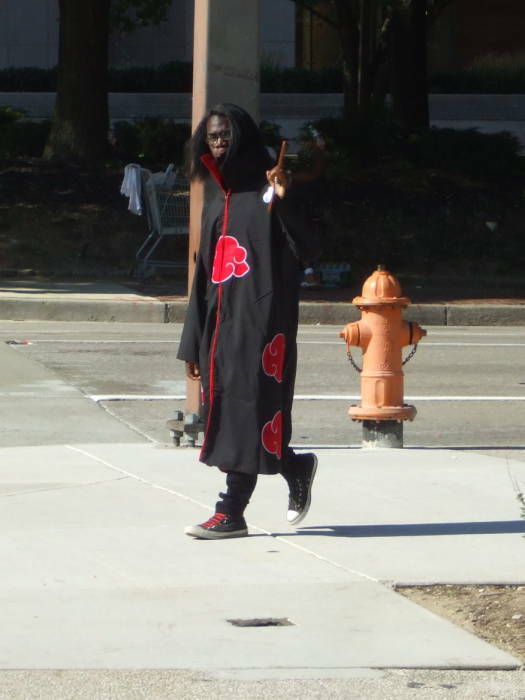 An ominous anime wizard walks down the street as several cosplayers leave the Otakon anime and manga conference. If you are interested in anime and manga, also see my page about comic book art in Brussels. The John H.R. Latrobe House is at far left in the first picture below, and the Baltimore HI hostel where I stayed is at right. The hostel is the brown building just beyond the white building. 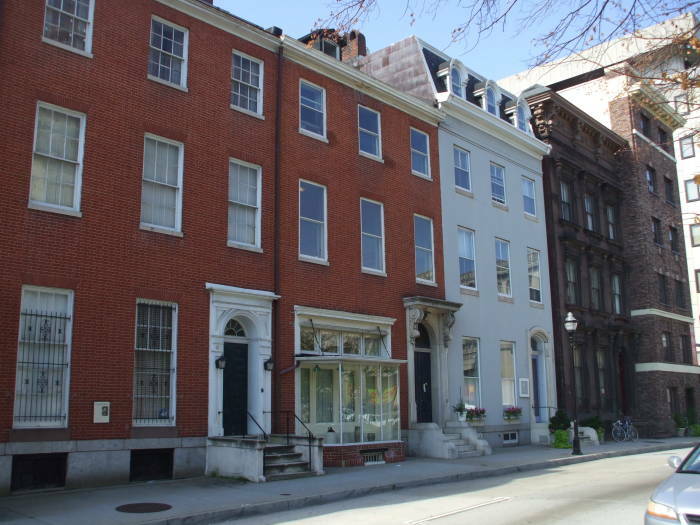 See my other Baltimore travel page for more details on the local Edgar Allen Poe sites and the HI hostel. You can get lunch at the nearby Lexington Market. 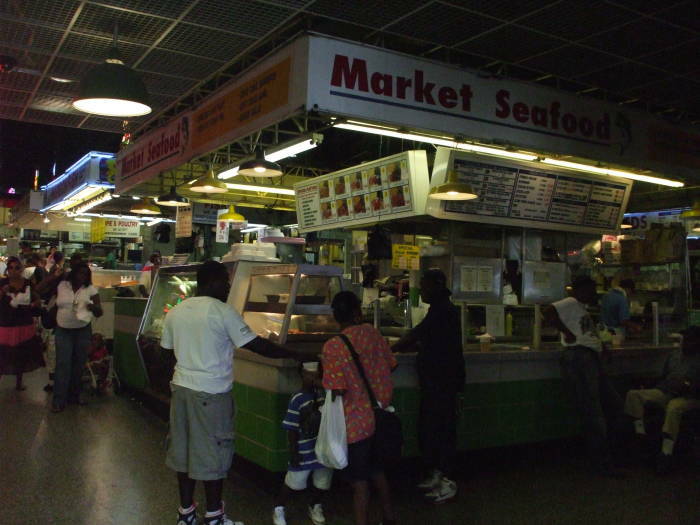 See my other Baltimore travel page for more details on the cavernous and carnivorous Lexington Market. Crab cake seems to be the state dish of Maryland. 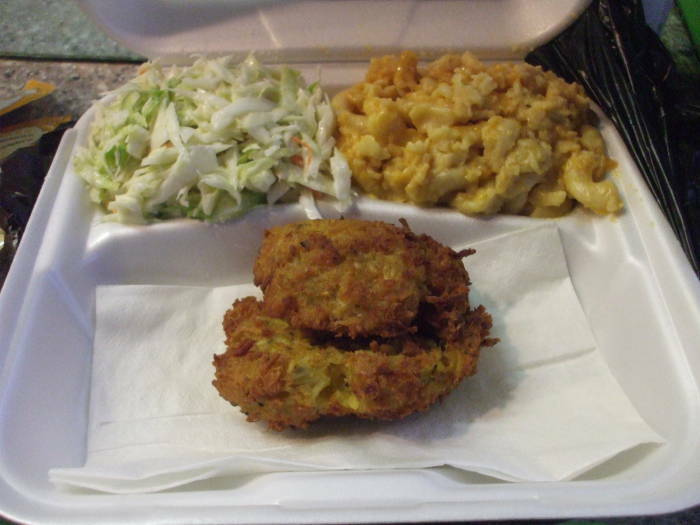 Here is the Market Seafood stand's version, with cole slaw and macaroni and cheese. 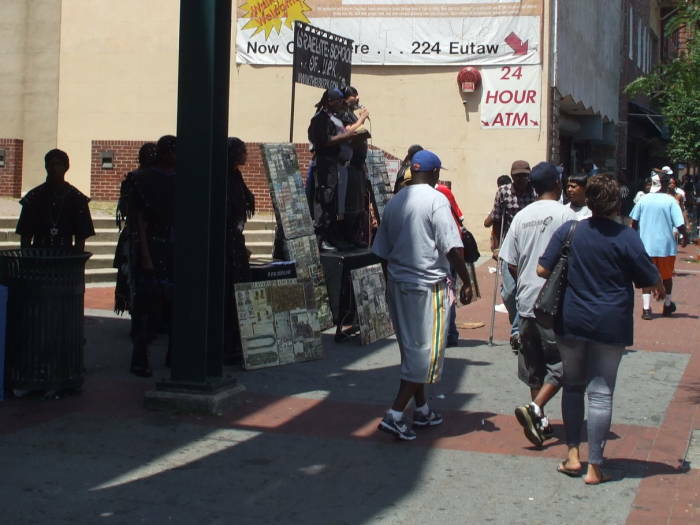 The Israelite School of Universal Practical Knowledge rants outside Lexington Market in Baltimore on some weekends. They're a black supremacist group, part of the Hebrew Israelism movement, a loose affiliation of groups with fairly surreal beliefs starting with African-Americans being the only true Jews, with its extremists (in the terms of the Southern Poverty Law Center) believing that "Jews are devilish impostors" and openly condemning whites as "evil personified, deserving only death or slavery." Some of the Hebrew Israelites believe that they are the descendants of King Solomon and the Queen of Sheba, teaching that "the Black man is a Jew" and "all genuine Jews are Black men". Others believe that they are descended from members of the Tribe of Judah who were exiled from the land of Israel after the Roman destruction of the Second Temple in 70 C.E. This group was dressed in purple satiny pseudo-Egyptian costumes, with posters and banners explaining that Christianity and mainstream Judaism were conspiracies and that American Blacks are the true descendants of the Twelve Tribes of Israel. On this day, they had a white biker guy who believed that he was really a Black Israelite who was really one of the only true Jews. My roommate's getup made more sense. A detailed map of the east coast of the United States shows that Baltimore is a major port well inland from the Atlantic Ocean. Its location provides a significant advantage for getting freight over the mountains to the Ohio River and easy transport down into the Midwest and down the Mississippi River to New Orleans. It's no surprise that major U.S. railroads have included the Baltimore and Ohio and Chesapeake and Ohio. 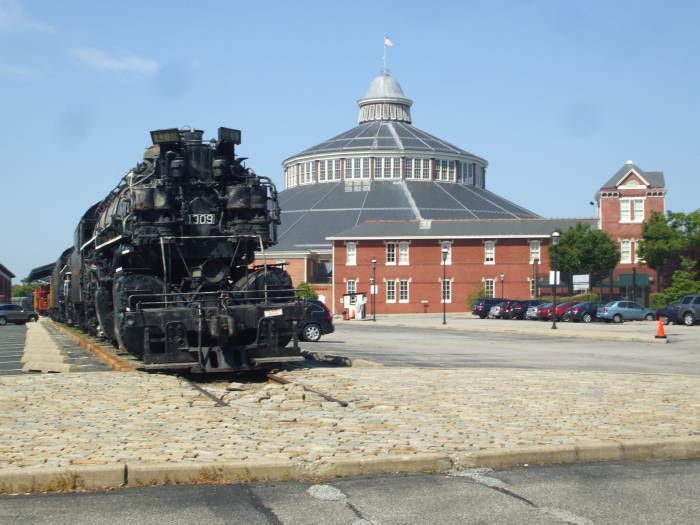 This is a large Chesapeake and Ohio locomotive at the railroad museum in West Baltimore. The Baltimore Orioles' Camden Yards ballpark was the first of the "retro" major league baseball parks, completed in 1992. 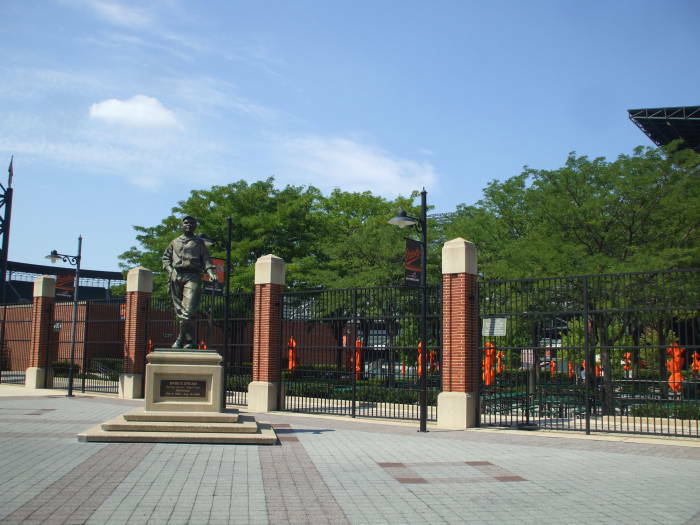 Its popularity led to a trend of traditional fan-friendly ballparks in downtown locations. It has hosted the third-highest number of fans in major league baseball since its opening. 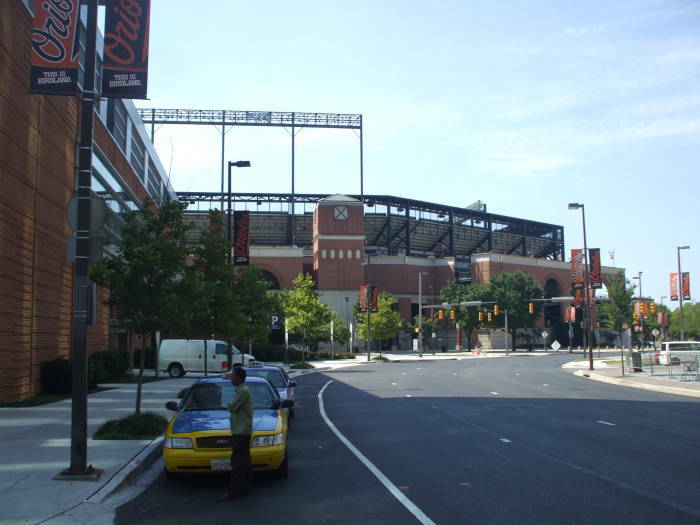 The ballpark is next to the former Baltimore and Ohio warehouse, and just the other side of that is the Camden Yards rail station used by the Baltimore Light Rail system and the MARC commuter rail service between Baltimore and Washington, D.C. The Camden Yards station was originally built in 1856 by the Baltimore and Ohio Railroad, when it served as its main passenger terminal in Baltimore. It is one of the longest continuosly operating rail terminals in the U.S. 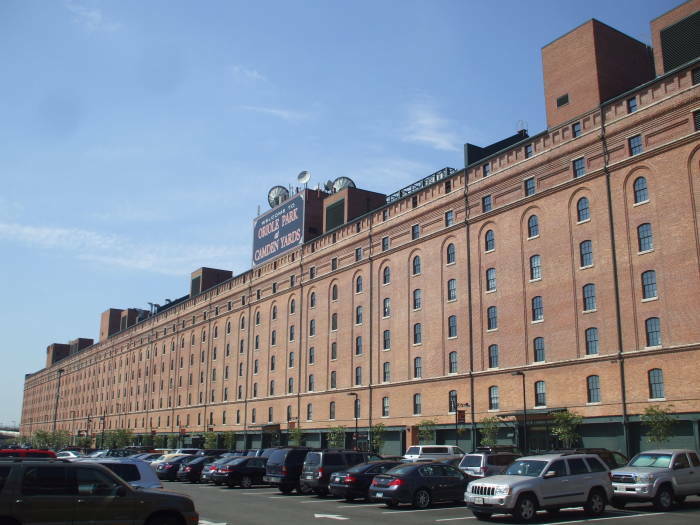 The Baltimore and Ohio Railroad's warehouse, now part of the Camden Yards baseball park complex, looms nearby. 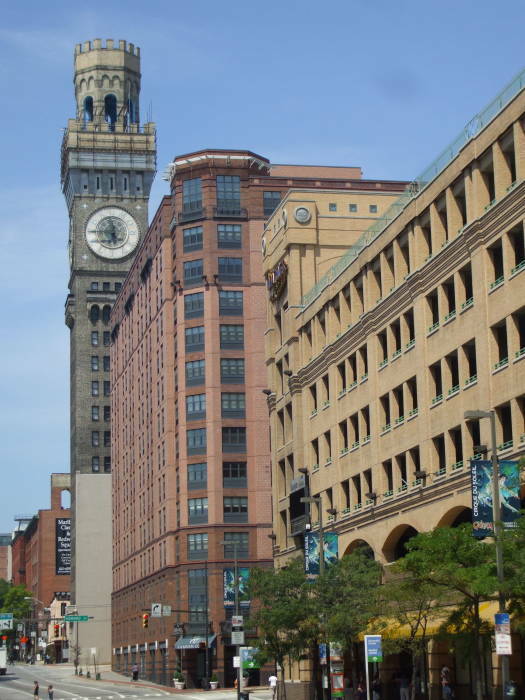 This is just two or three blocks from the waterline of Baltimore's Inner Harbor, and was where freight was transferred between ships and the B&O trains. 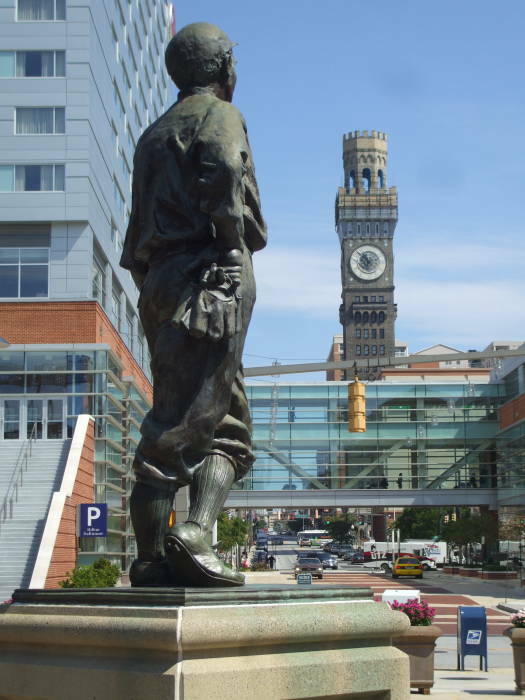 A statue of Babe Ruth, famous for his years with the New York Yankees but born just a few blocks west of Camden Yards, stands outside the ballpark looking toward the Bromo-Seltzer Tower. 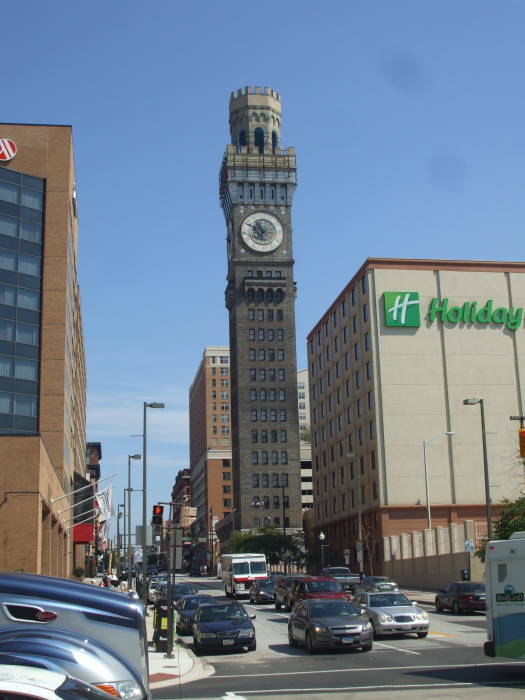 The Bromo-Seltzer Tower was built in 1911 as the highest building in Baltimore, holding that ranking for the next twelve years. The tower is 289 feet tall, with clock faces 24 feet in diameter and hands 10 and 12 feet long. The building was mostly abandoned by 2002, but five years later a city office renovated it to provide 33 artists' studios up through the tower. The Baltimore City Fire Department had opened a fire station at its base in 1973, still housing Medic 1, Medic 23, Engine 23, MAC23, Rescue 1, BCFD Hazmat 1, and Airflex 1. Bromo-Seltzer is an over-the-counter antacid medication based on acetaminophen, sodium bicarbonate, and citric acid. Its name comes from sodium bromide, a component of its original formula and a member of a class of tranquilizers withdrawn from the U.S. market in 1975 due to their toxicity.